This stir-fry recipes post is courtesy of our contributor Carolyn…I bought a “vintage” electric wok from a garage sale a couple years ago. I say vintage because I have memories of an electric wok as a child and not to mention the lady on the instruction manual had Farrah Hair and the kitchen was wood paneling. I use the retro red wok about once a month to make an ordinary veggie, meat, and soy sauce stir-fry. 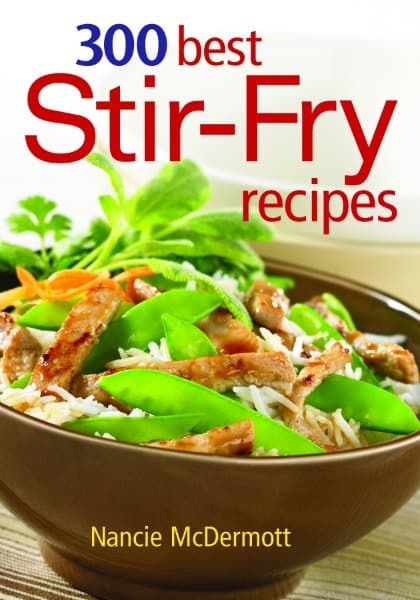 Obtaining the 300 Best Stir-Fry Recipes cook book has opened up my palate to new flavors and textures of one pot meals! The preparation and cooking time for stir-fry’s is quick and in one dish we got a hearty meal. 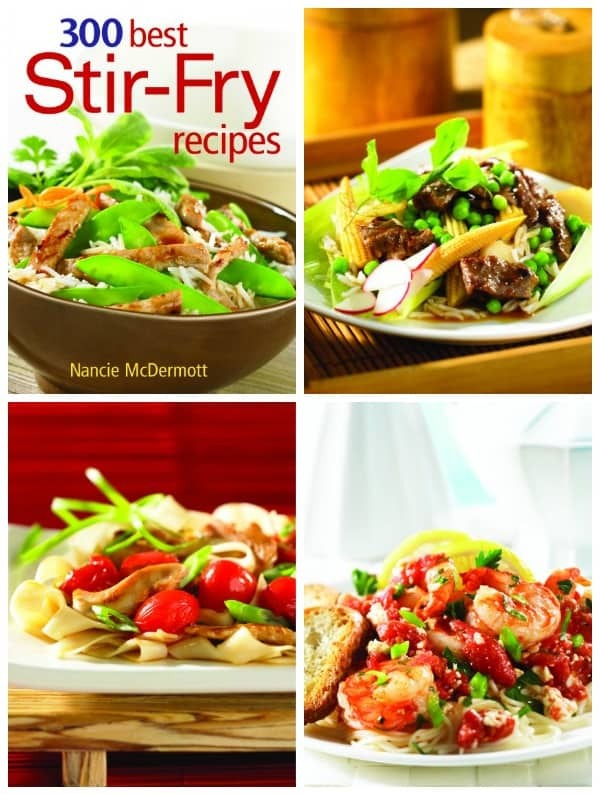 The three recipes from the book by Nancie McDermott I chose to cook were different than the stir-fry’s I usually make but the majority of the ingredients I already had in my home! The first stir fry I made was Chicken and Cherry Tomato Toss and I cooked egg noodles as a side. Ginger was a distinct flavor in the meal, I have never cooked with it before and it has since become one of our new favorite flavors! A stir-frying lesson I learned from this first recipe (actually I reads it in the prep work section of the book after I made the recipe) is that “The key to stir-fry success is to prepare your ingredients well and then arrange them by the stove before you begin to cook.” I did not do this and had some soggy ingredients. OOPS! My boyfriend and son loved it besides and this recipe has officially been marked as a reoccurring dish in our line up! Author: Courtesy 300 Best Stir-Fry by Nancie McDermott © 2014 www.robertrose.ca Reprinted with publisher permission. In a small bowl, combine chicken stock, soy sauce, dark soy sauce, if using, sugar and salt and stir well. Set aside. In a wok or a large deep skillet, heat oil over medium-high heat. Add garlic and ginger and toss well, until fragrant, about 30 seconds. Add chicken and spread into a single layer. Cook, undisturbed, until edges turn white, about 1 minute. Toss well. Cook, tossing occasionally, until no longer pink, about 1 minute more. Add chicken stock mixture, pouring in around sides of pan. Cook, tossing occasionally, until chicken is cooked through and coated in a thin, smooth sauce, 1 to 2 minutes more. Reserve a generous pinch of green onions for garnish, and add remaining green onions and cherry tomatoes to pan. Cook, tossing once, for 1 minute more. Transfer to a serving plate. Sprinkle reserved green onions over chicken. Serve hot or warm. *Dark soy sauce adds handsome color and depth of flavor to stir-fry dishes, but is not essential to the recipe. Omit it if you don’t have it on hand. It’s a good background stir-fry seasoning, and keeps long and well, so consider buying a bottle if you stir-fry often. You’ll have a pleasing amount of dark, delicious sauce, perfect for spooning over rice along with the spicy chicken. The sauce will be thin, Thai-style, since no cornstarch is used to thicken it. The next dish I made was Shrimp with Tomatoes, Lemon and Parsley with white rice. I have never put tomatoes in a stir fry before but after my guys enjoyed the first stir-fry so much I decided to go with another recipe with them in it. The recipe called for Shaoxing rice wine or dry sherry. I wanted the shaoxing rice wine because it seemed more tradition for a stir-fry, so I went on a culinary adventure and searched three stores before I found it! The search was well worth it though; my guys have another new favorite flavor. My favorite section of the Stir-Fry Recipes cookbook is the equipment and ingredient glossaries; I learned what shaoxing rice wine was, among other ingredients I didn’t really know before! In a small bowl, combine lemon juice, sherry, soy sauce, salt and sugar and stir well. Set aside. Heat a wok or a large deep skillet over high heat. Add oil and swirl to coat pan. Add garlic and onion and toss well. Add green pepper and toss well. Cook, tossing occasionally, until fragrant, about 30 seconds. Push peppers and onions aside. Add shrimp and spread into a single layer. Cook, undisturbed, until most of the edges turn pink, about 1 minute. Toss well. Cook other side, about 30 seconds more. 4. Add lemon juice mixture and toss well. 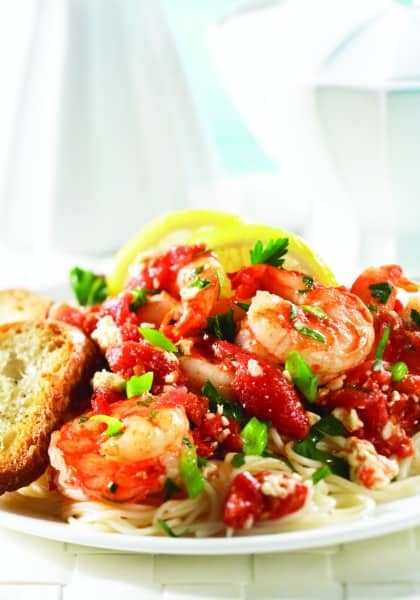 Cook, tossing occasionally, until shrimp are cooked through, 1 to 2 minutes more. 5. Add tomatoes and toss well. Cook, tossing once, for 1 minute. Add parsley and green onions and toss well. Transfer to a serving plate. Serve hot or warm. *To chop plum tomatoes, trim off stem end, and cut each tomato lengthwise into quarters. Cut each piece crosswise into 3 or 4 big chunks and transfer to a small bowl, leaving the juice and any easily released seeds behind on cutting board. Chopping the tomatoes in this way removes some of the juices and seeds and helps keep the sauce from diluting. These chopped tomatoes should be big, so they are in the sauce more as a vegetable than as a seasoning. The final recipe was chosen because I had a thirty minute window to cook and eat! 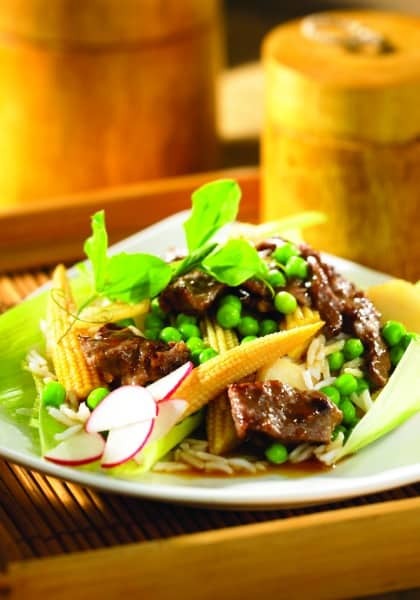 The Speedy Beef Stir-Fry with Chunky Vegetables prep took 10 minutes and the cook time was about five-eight minutes. I bought pre-sliced beef so that saved me a couple minutes. The dish was pretty close to what I usually make with a bit of our new favorite flavors gingerroot and shaoxing rice wine. I threw in some extra chili flakes on my personal plate because I like a little fire in my food and my boyfriend added some extra soy sauce to perfect his! In a bowl, combine sherry, water, dark soy sauce, if using, and cornstarch and stir well into a smooth paste. Add beef and stir to coat well. Set aside for 10 minutes. In a small bowl, combine chicken stock, soy sauce, sugar and salt and stir well. Heat a wok or a large deep skillet over high heat. Add oil and swirl to coat pan. Add garlic and ginger and toss well, until fragrant, about 15 seconds. Add beef mixture and spread into a single layer. Cook, undisturbed, until edges change color, about 1 minute. Toss well. Add chicken stock mixture, baby corn and water chestnuts. Cook, tossing occasionally, until beef is cooked through, about 2 minutes more. Add peas and cook, tossing once, for 1 minute more. Transfer to a serving plate. Serve hot or warm. TIP: To freshen the flavor of canned baby corn cobs, drain well, cover with cold water and drain again. Transfer leftover baby corn to a jar with water to cover. You can slice baby corn cobs crosswise into 3 or 4 chunks or into thin rounds, and add them to soups and salads just before serving. 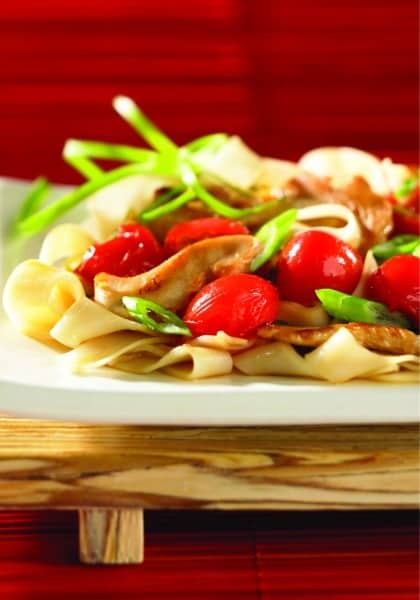 The 300 Best Stir-Fry Recipes has been a great addition to this rookie-cook’s kitchen! I learned some new methods for cooking and have been introduced to some wonderful flavors. Visite RoberRose.ca to purchase your own copy of 300 Best Stir-Fry Recipes. For more delicious recipe ideas, visit our Party Food & Family Meals page. *Disclosure: I received a copy of this book in return for an honest review. All opinions expressed here are my own. Recipes and images are courtesy 300 Best Stir-Fry by Nancie McDermott © 2014 www.robertrose.ca Reprinted with publisher permission.